View More In Jewelry Chests. What's in a name? For the majestic wooden jewelry chest, it's certainly a fitting description. This beautiful, extra-large jewelry box won't take up much space on your dresser but provides plenty of storage for all your favorite daily accessories. The inside of the lid features two swing-out chain bars with securing pouches, letting you hang several necklaces without worrying about entanglement. The top deck is equipped with two long compartments, four watch pillows and two ring rolls. The top drawer features four more ring rolls and nine medium-sized compartments for bracelets or bangles. 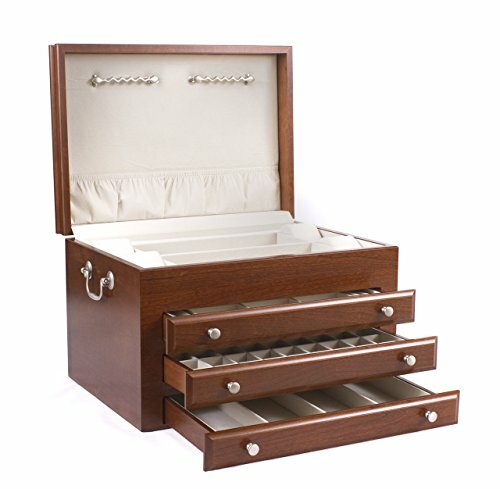 The middle drawer features 33 smaller compartments for rings, earrings and more. Four large compartments are included in the bottom drawer. The box is crafted from solid cherry hardwood and is equipped with metal, brushed nickel-finished hardware and handles. Choose between a cherry or mahogany finish (subject to availability). About American Chest don't settle for inferior-quality imports, let American Chest provide you with beautiful, hand-crafted chests, boxes, urns and more. For three generations, American Chest has created the finest products available, made from genuine American hardwood and never mdf or plywood. Each of their pieces is individually inspection for imperfections, ensuring a snug, tight-fitting lid and smooth, hitch-free drawers. The products are all sanded and finished by hand for guaranteed perfection. With over 100 years of experience, you can rest assured that any piece purchased from American Chest is the finest available on the market. Overall dimensions: 17l x 12.13D x 10.75H in.. Hardwood frame with your choice of finish. Top deck with ring rolls and watch pillows. Top drawer with 9 medium compartments. Middle drawer features 33 compartments for earrings. Larger storage in bottom drawer. Interior lined in soft white fabric. Overall dimensions: 17l x 12.13D x 10.75H in. If you have any questions about this product by American Chest, contact us by completing and submitting the form below. If you are looking for a specif part number, please include it with your message.